Comments: The coolest nintendo wrist-watch I have seen! 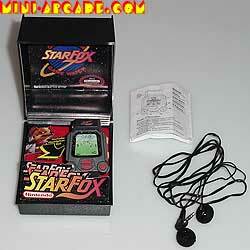 A rare starfox version, with headphones. The sounds are quite amazing using the headphones - it sounds just like an atari 2600 game! The game is actually fun to play too. A must have for nintendo collectors. 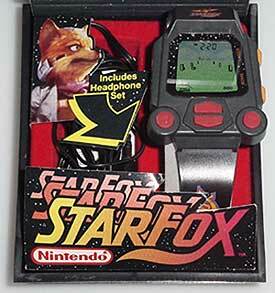 just take a look at the amazing little starfox character with HIS headphone set on. The fox is wearing a funny little space uniform of some kind - this should have been a TV show!